My book chronicles my personal struggles and triumphs. It is a shear testimony for those who are in need of a little faith. Without faith we are stuck. To breakthrough whatever you are going through renew your faith and gain access to a whole new life. 25% of all book sales go toward helping women of all ages who are suffering from domestic violence and substance abuse. To order your book via mail, learn how here. Update: My new book ‘Breakthrough A Testament of Faith’ is available now! Update: New talk show Changing Steps with Belinda. Update: Belinda Baker Opens Independent Living for teens. 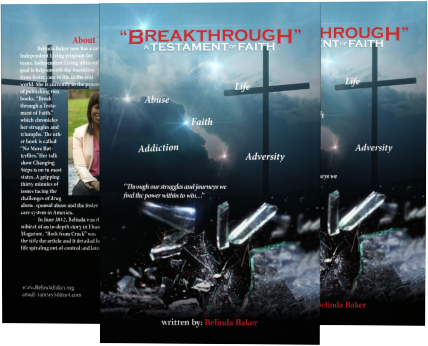 Update: Belinda Baker Authors 2 New Books. Update: Ebony Magazine Features Belinda Baker.